1 Kraft Caramels, 14 oz. pkg. Mix cookie crumbs and melted butter. Press mixture onto the bottom and 2 inches up the side of a 9 inch spring form pan. Put caramels and milk (1/2 cup) into a microwavable bowl and microwave for 3 minutes or until completely melted; stir each minute. 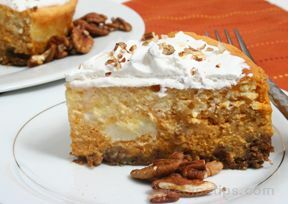 Stir in pecans and pour 1/2 mixture over the crust and refrigerate for 10 minutes. Cover and refrigerate remaining mixture. 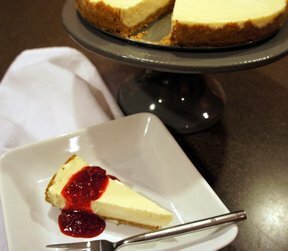 Beat cream cheese, sugar, flour, and vanilla with an electric mixer until combined. Beat in milk (1/4 cup) until smooth. Stir in eggs. Pour filling into crust-lined pan. Place on shallow baking pan. Bake at 375°F for 35 minutes, or until area around outside edge appears set. Use sharp knife to loosen the crust from the sides of the pan. Cool for 30 minutes. Remove sides of pan and allow cheesecake to cool completely. 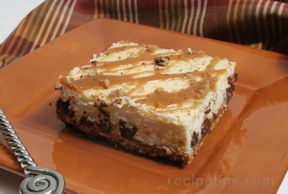 Before serving, microwave remaining caramel for 1 minute and pour over cheesecake. Melt the chocolate and drizzle over cheesecake.